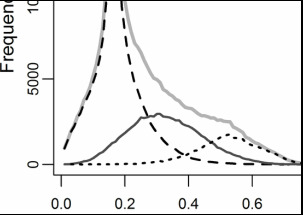 How important are functional and structural heterogeneity to ecosystem productivity across scales? What controls drought deciduous phenology in savanna-type ecosystems? How important are biosphere-atmosphere feedbacks in savannas (including fire and herbivory) to the Earth system as a whole? How can we combine diverse remote sensing products to inform ecological theories about biodiversity and the carbon cycle? How can we improve land surface models with a combination of ecological theory and remotely sensed data sets? What can we do as a lab to increase diversity in STEM fields? What can we do as a lab to promote open science? 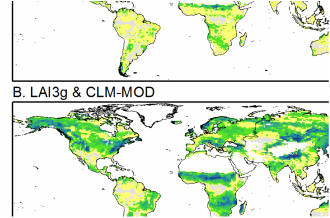 Drought deciduous phenology is an overlooked part of most land surface models. We think that should change. Santa Cruz Island is a BIG island off the coast of Southern California. And it has endemic foxes. And scrub jays. And so much more. Plant chemical traits can say a lot about the ecosystems they inhabit. 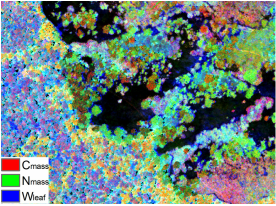 Airborne remote sensing is an incredible tool for thinking about chemical traits across landscapes.